Nothing beats a warm and fragrant dish on a cold winter night. 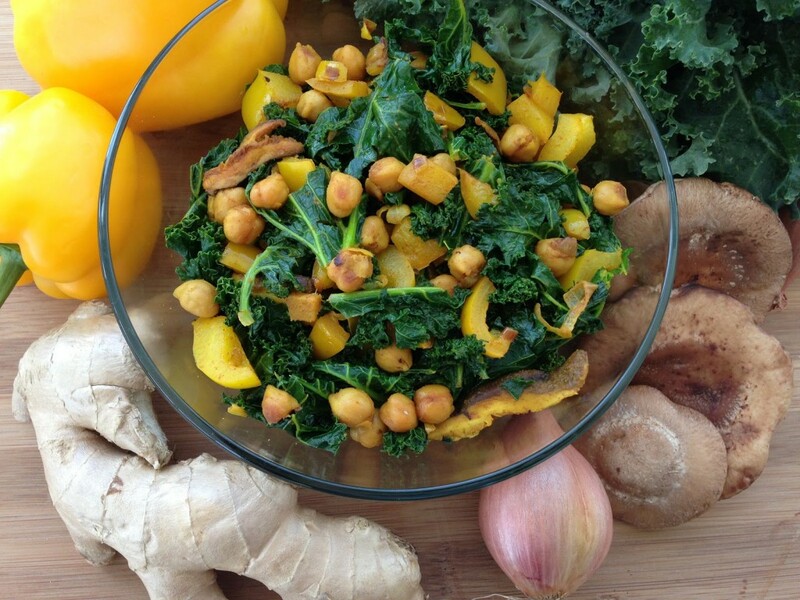 I made this recipe this weekend for a dinner party, after being inspired by the curried kale and chickpea dish at V Spot Cafe. It was a big hit, so I’m excited to share it with you…besides being super healthy, it’s super fast to put together. Turmeric: Highly anti-inflammatory and known as a potent protector against many types of cancer. Shitake Mushrooms: Excellent promoter of cardiovascular and immune health, they are also a great source of iron and B vitamins. Kale: One of the most nutrient dense and anti-oxidant rich foods available, kale is a powerful blood and cell detoxifier. 1/2 red onion diced, about 2 oz. 1. Heat enough oil to cover the bottom of a pan over medium low heat. 2. Add the onion and garlic and cook for 1 minute before adding the spices. Let cook an additional minute before adding ginger, bell pepper, shitake mushrooms, and chickpeas. Cook for another 2 minutes, or until the mushroom get glossy and the peppers start to get soft. 3. Add in the kale and cover, for 1 minute. It will start to shrink and turn bright green. You may have to add in batches, as it starts off with a lot of volume, but quickly shrinks down. Stir the kale, and cover an additional 2 minutes or so, until all of it is uniformly bright green and soft. Remove from heat, add salt and pepper to taste.